Many of the users of the Adidas Nemeziz 18.3 Firm Ground attested to its excellent overall quality. A few reviewers said that this football boot provides a great feel for the ball during free kicks and long passes. This football boot provides good comfort said the majority of its users. Based on the reviews of a few buyers, the Adidas Nemeziz 18.3 Firm Ground is another boot worthy of its price among the Nemeziz list. An individual user commended the sock for adding support to the ankles without being too restrictive. This is very similar to what they also said about the Adidas Nemeziz 18.1 Firm Ground. The lightweight feel of this football boot is appreciated by most who got to try it. A certain buyer noted that this firm ground football boot feels slightly narrow on foot. Some users observed that the boot runs smaller than the regular size. The synthetic material of this football boot does not look reliable, based on what critics had to say. According to a few reviewers, this football boot is a bit difficult to put on. The Nemeziz 18.3 Firm Ground is another football boot from Adidas that has amazed most with its performance. One thing to note about this football boot is its fit, which is a bit too narrow, an issue it shares with the Nike Phantom Vision Elite DF Firm Ground. Then again, getting a half size bigger will resolve the issue and will bring the comfort back. Overall, despite its minor fit complaints, this football boot still deserves an applause. Its quality, performance, and comfort are all worth its price. They’ve made some nice improvements over the Nemesis 17.3 which had a lot of good qualities to it. For eighty bucks, I think it’s pretty good. It does not feel cheap in any way at all. The Adidas Nemeziz 18.3 Firm Ground emerges from the lower tier of the renowned Adidas collection. Crafted with game-dominating agility, this football boot is sure to lead players to the winning goal. It has been fitted with superior features that make it a tough match for its competition. Mesh material lines the upper of the Adidas Nemeziz 18.3 Firm Ground. This flexible Agility Mesh gives a form-fitting wrap around the foot for the best fit. Moreover, it efficiently ushers in a soft, responsive touch for superior ball control. Extending from the upper is the engineered bandage that is quite resemblant to the Agility Bandage seen on the Adidas 18.1. This detail serves to provide ankle support similar to that of a mid-top football boot and mobility like that of a low-top football boot. Another detail to this football boot is its standard lacing system, which works to reinforce the snug feel of the mesh upper. The laces also offer wearers the option of re-adjusting the tightness to fit their comfort. On the base, the Adidas Nemeziz 18.3 Firm Ground a lightweight outsole that utilizes an Agility stud configuration. The stud pattern composed of bladed studs is meant to deliver the best traction on the firm ground pitch. The Adidas Nemeziz 18.3 Firm Ground comes in the standard sizes for men, that is from 6.5 to 13.5. This football boot offers a snug fit owing to the Agility Mesh material that lines the upper. A central lacing system is employed to allow for customization in overall fit. Meanwhile, the engineered bandage that extends to the ankle provides the needed support and mobility to pace with ease on the pitch. The upper of the Adidas Nemeziz 18.3 Firm Ground utilizes the brand’s Agility Mesh. With its high flexibility, this material wraps comfortably around the contours of the foot for a snug fit. It also allows for a close feel of the ball for enhanced control. Another visible detail of the upper is the engineered bandage that extends to the ankle. The elastic collar provides support and allows for optimum mobility of the foot. Over the midfoot, a central lacing system reinforces the fit while also allowing for some degree of personalization. 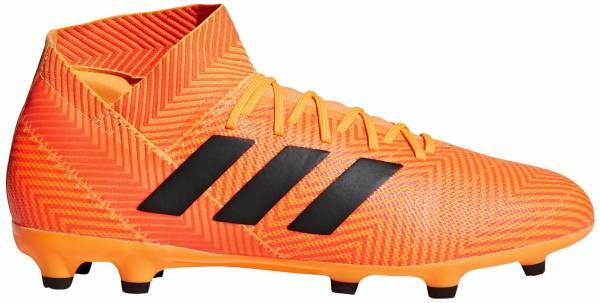 Adidas has designed this football boot with a lightweight outsole that employs an Agility stud configuration. With seven-bladed studs on the forefoot and four on the rear foot, this soleplate is set to deliver reliable traction on the natural grass pitch. This will benefit players greatly when they make quick cuts and sharp turns during the game. The Adidas Nemeziz 18.3 Firm Ground is available in seven color options example: Zest/Core Black/Cloud White colorway, Ash Silver/Running White colorway, and Core Black/ Cloud White colorway.